Even if you're planning on a late layup, get supplies or make arrangements early for our services so you can be sure to get everything you need, or get the pick of the schedule before we get busy. Schedule as soon as you know your pullout date, so your boat can be protected ASAP from freezing, dirt, snow, animals, & insects. Consider washing/waxing in the fall, and have your boat shrinkwrapped to the water line... In the spring, you'll love yourself for it. Many brands say for RV's & Boats but contain alcohol, are combustible, and will cause damage to hoses, seals, impellers, joker valves, etc... Tractor Supply Traveller®, West Marine Seafit®, and Ace Hardware Camco Arctic Ban® are a few of these. Some marinas are even banning the use of these alcohol blends because they are combustible and are not safe for the environment. And the few cents you save will cost you MUCH more in damage repairs. Be Sure to Use Only Pure Propylene Glycol! If you don't need our guys to prep your boat for the off-season, we carry the proper Winterizing & Shrinkwrapping supplies & accessories you'll need to do a complete job yourself, including equipment to make the job easier. . . Freshwater System & Engine Antifreeze, Winterizing Kits, Cleaners, Fuel & Oil Stabilizers, Oil Changers, Motor Flushers, Lube Pumps, Service Parts & Manuals, Tarps, Bungee Cords & Line, Shrinkwrap Material, Doors, Tape & Accessories, Trailer Parts, and More. . . All at discount prices to save you money! Port Supply Customers... Save Time, Gas, and Money! Harbortown welcomes the opportunity to provide you with the supplies you need so you don't need to make the trip to North Olmsted or Sandusky. Many of our prices are already lower than Port Supply. But where necessary, we'll match Port's pricing whenever we can. If we don't currently stock something you're looking for, we will accommodate your product needs even better as you let us know the items/brands/sizes you most commonly purchase. Before you put your boat to bed for the winter, you should do a comprehensive inspection, or have it done, to make sure you won't be starting out next season with troubles. Freezing can cause more damage if something is already wrong with your boat, motor, or outdrive. A few dollars this fall can save you big money next spring. The following information is not detailed enough for someone who doesn't know how to perform all the procedures below. It is designed only as a very basic guide, and it is in no way a comprehensive maintenance program. We hope these helpful hints benefit you, but keep in mind that this information is not all-inclusive. If you're not sure what to do, or how to do it, don't take chances. Have professionals do the work for you. The key to safer storage is. . . If you're not sure what to do or how to do it, have your boat prepped for winter by professionals. You wouldn't work on your car if you didn't know what to do, so why take a chance with your boat? We may like to think of our boats as toys, but they are far from it. If you miss something or you do something wrong during fall layup, the few bucks you tried to save doing it yourself won't justify what it will cost you in major repairs, even with our low shop rates. Preventive maintenance, proper product use, and thorough jobs are the best way to save time, money and headaches later on. Damage can be caused by shortcutting and quick fixes. Taking time to do it right, or having it done right, is more beneficial to you and your boat in the long run. Spending a few extra dollars now can save you hundreds or even thousands in the spring! Your boat is an investment, and cutting corners can cost you. Whether you do your own fall layup or have it done, here are a few tips & suggestions . . . The first thing to think about is your fuel. It will be sitting in your boat for several months. The reason you should think about it first is that you want to add your Fuel Stabilizer before shutting down your engine(s) for the winter. To prevent fuel problems while storing your boat, fill the tank almost full (don't top it off), and use fuel stabilizer. It's important to run the stabilizer through the entire fuel system for 10 minutes before fogging for complete protection. Don't put stabilizer just in the tank after the motor has been shut down. The rest of the fuel and fuel system won't be treated. Also, you should store your boat with an ALMOST full fuel tank, because changes in temperature can cause fuel to expand and contract, causing leakage if you top it off. Not enough fuel in the tank causes oxidation, corrosion, and water formation on the tank walls, which is especially critical if your fuel contains Ethanol. Fumes in the space of an empty or partially full fuel tank can induce an explosion. The right time to fuel up and add fuel stabilizer is on your last run with the boat. Speaking of fuel, don't forget to change your fuel/water separating filters, especially if you haven't done so recently. Change the lower unit lube. If there's water in the lower unit, don't wait until spring to find out it froze over the winter. A few dollars now is a good investment to prevent having to replace a cracked lower unit in the spring. Service the lower unit, or have it serviced, if it hasn't been done in the past season (or every other season if your boat gets minimal use). Check for water in the engine oil, whether or not you're planning on changing the oil and filter(s) now. Use an oil pad to prevent spills in the bilge while draining and replacing oil. If you're waiting until spring to change the oil that's fine, but add Oil Stabilizer to the crankcase. This stops oil breakdown, deals with biocides, and prevents rust and corrosion on the internal engine components. Like the fuel additives, oil stabilizer should be added and allowed to run through the system for 10 minutes before you winterize and fog the motor(s). 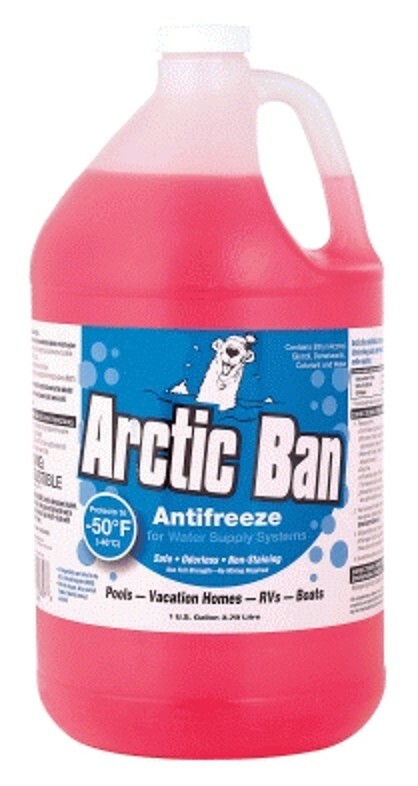 If you have a closed system, check the ethylene-glycol antifreeze. You'll still need to winterize the rest of the motor with propylene-glycol, non-toxic marine engine antifreeze, (fresh water runs through other parts of the engine, such as the cooler). Pouring antifreeze into the motor(s) to winterize can be done, but it's easy to miss pockets that may hold water and freeze. We've had customers who did it this way for years with no problems, and then one year their luck ran out. The best way to protect your motor is to run antifreeze through the system. Make sure to use propylene-glycol, which is non-toxic marine grade antifreeze. And don't cheap out by using antifreeze containing alcohol for a few cents less. Non-marine grade may say non-toxic, but the additives can damage hoses, seals, and other parts. Marine engine antifreeze is rated at -100oF full strength, and it contains corrosion inhibitors. 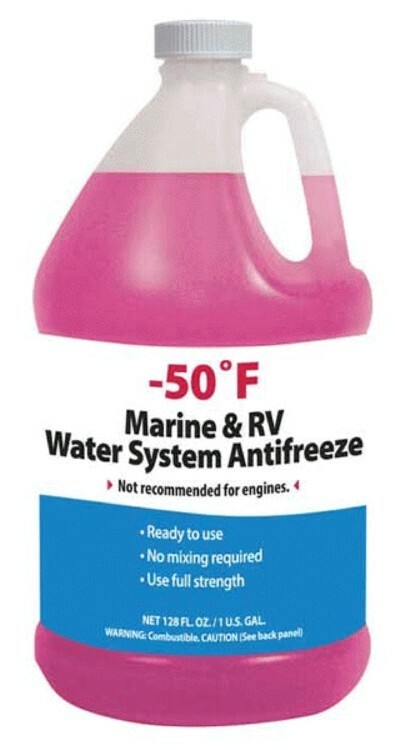 Fresh-water/RV antifreeze is only rated at -50oF full strength. Both are non-toxic, but both lose their strength when mixed with water in your engine or water system. 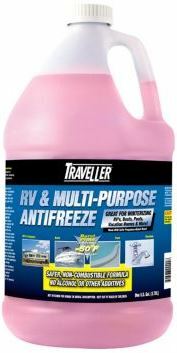 The use of freshwater/RV antifreeze is NOT recommended for engine winterizing. Don't skimp on antifreeze. The few dollars extra for a couple more gallons and for the right mixture is well worth the protection and peace of mind you gain. Just ask anyone who has had to deal with the springtime expense and anguish resulting from layup shortcuts. And if you store inside, a few dollars for added protection in case the heat goes out can save you a major headache and money in the spring! Before winterizing your motor, examine the water intakes for debris. Check for water pump or impeller problems. Always make sure you run the motor on fresh water long enough to bring it up to temperature and open the thermostat, then shut down the engine, drain the block, and switch over to running the antifreeze through. This normally takes about 5 gallons of -100oF engine antifreeze per motor. The easiest way to accomplish this is with a winterizing kit. You can purchase a ready-to-go kit that will allow passage of both the fresh water & antifreeze without changing in mid-job, or a kit that you need to hook up after you remove the fresh water line from the motor flusher. When you reach the last couple inches of antifreeze in the container, fog the motor until the engine stalls. If you collect a sample of the antifreeze as the last of it is expelled from the exhaust, you can bring it in to us and we'll test the mix quality for freeze-point. * If you're not sure what you're doing, this isn't the time to learn, unless you have someone with knowledge & experience with you to guide you through the entire process, start to finish. Have a professional take care of it if you have any doubts at all. If you make a mistake, it can be a very costly lesson! Proper storage of a marine battery is important. If the battery is not at a full state of charge, it can freeze. But heat causes a battery to discharge faster. A cool, dry area is the best place to store, such as a shelf in a garage or basement, as long as dampness isn't a problem in the area you choose. Batteries should be charged about once a month for 12 hours at about 2 amps to maintain them over the winter. For more information on batteries, see our Battery Maintenance Helpful Hint. It's much easier to clean your boat bottom and water line now than in the spring after months of sitting with caked-on algae and other growths. Besides, it's one less thing you'll have to deal with in the spring. Bottom cleaners are available in several different forms and strengths, both in mixable dry types and ready-to-use liquids. Be sure to use the proper precautions when using acid products that can be harmful to skin, eyes, and lungs. If you don't like to work with hydrochloric acid, try a product containing oxalic acid. Make sure the hull is in good condition. Check for cracks and blistering if your boat is fiberglass. Good prep work is 90% of any job, especially when it comes to doing bottom work. So it may be wise to start doing repairs now. Opening up the damaged areas and allowing the moisture to escape is best done over time, and what better time to do it than when you're not using your boat! Then you'll be ready to start repairs in the spring. Ignoring these problems will only create larger and more expensive repairs if you continue to use the boat while in poor condition. Bottom paint alone will not seal the damaged areas. If you use a canvas or poly cover, prevent "pools" by using the proper support. To prevent tears, pad any sharp corners, wood framing or wood supports with old pieces of carpeting if you have any, or purchase some inexpensive trailer bunk carpeting. If you prefer, you can also use adjustable support poles, either with a metal tip to fit into a grommet or snap, or rubber on both ends for use without a grommet or snap. You can also help your canvas cover do its job by using canvas waterproofing. Secure your cover to a sturdy frame or strap it around the boat, not to the trailer or cradle, and make sure there are no overlapping portions that are loose. Have extra grommets added to your canvas if there aren't enough. For poly tarps, use Tarp Clips for a secure fit. They easily fit onto the edge of the tarp and create an extra "grommet" anywhere you need one. Poking extra holes that aren't reinforced with a grommet and allowing pockets and flaps where the wind can catch are the two major causes of tarps tearing, leaving your boat exposed and unprotected. If you prefer to shrinkwrap your boat, we can provide the necessary items you need such as 7 mil film, tape, strapping, vents, caps, doors, gloves, guns, etc. If you prefer to have it done professionally, we offer off-site and on-site shrinkwrapping services. If you use a cradle or stands, check them out before setting your boat. If you store your boat on a trailer, make sure it's ready to roll when you are! Check it thoroughly before storing your boat. Don't wait until the day you pull your boat to find problems. If you don't have time to do it yourself, give Harbortown a call and schedule repairs and servicing. For details about trailer care, see our Trailer TLC Helpful Hint. Last but not least, if you remove your drain plug, put it somewhere that's easy for you to remember, or make a note somewhere, so you won't forget to put it back in the spring! If you have questions about something else, just ask us when you stop in for your parts & supplies, and we can give you more detailed assistance. *Harbortown Marine tests and guarantees every winterizing job performed by our shop personnel. Customers who do their own winterizing assume full responsibility for the quality of the antifreeze test sample provided, and any damage which may occur from providing us with a flawed sample. Antifreeze mixture testing is provided as a customer convenience only, and it is not a guarantee against freezing. Harbortown Marine is not liable for work performed by others, or the conditions under which customers obtain test samples. Harbortown Marine in Vermilion Ohio on the shores of Lake Erie has all your Nuatical Needs for inboard outboard boats. For Lake Erie Fishing for Lake Erie Walleye Fishing.